Last Friday I was cooped up all morning in my pajamas, a mad writer in the final stages of novel editing. My eyes were burning and I was barely on speaking terms with the English language. 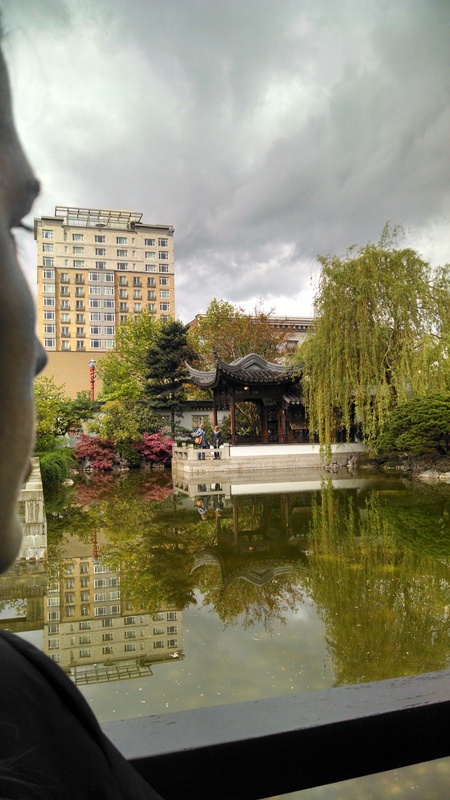 As it was due time to see the light of day, I rode Silvie the bike through bustling downtown Portland and found some surprising tranquility. 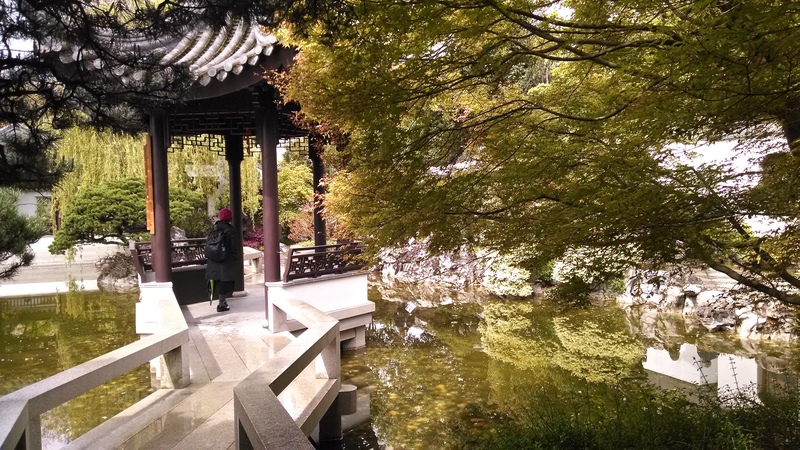 There are things about Lan Su Chinese Garden that would normally keep me far, far away. It’s located in the city’s touristy Chinatown and you have to fork over nearly 10 bucks to get in the front door. But, I gave it a go. I decided to geek out and take the walking tour. The tour guide with the cheesy Yin-Yang baseball cap almost made me change my mind, but he had me with his calm demeanor. He even told us we could leave at any time, or wander away and come back. There were covered walkways throughout, but the rain was a soft drizzle so none of us cared about getting wet. 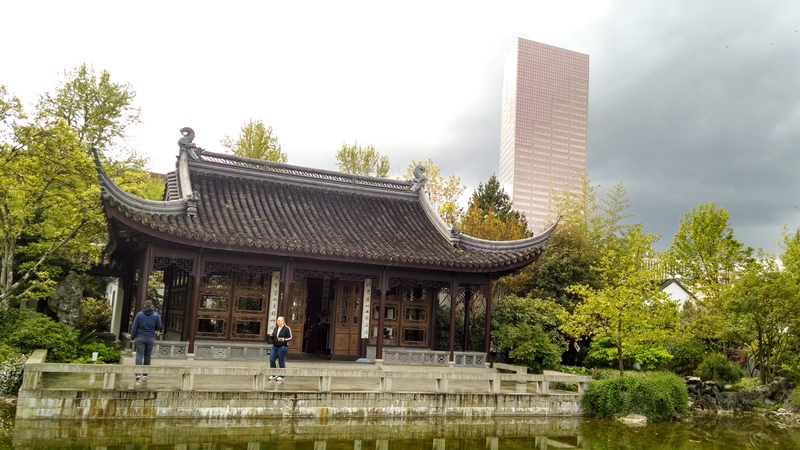 Rumor has it that a heavier rain at Lan Su is nothing short of magical as the rain slips off the ornate roofs to create a beaded curtain effect. It was incredible to learn the meaning of everything encompassing us—the stories and poetry, the Yin and Yang from floor to ceiling. Bridges were designed in a zig-zag pattern to encourage the walker to slow down and absorb their surroundings. At a leisurely pace I marveled at this island of serenity surrounded by noise and grime, lapsing into a walking meditation. 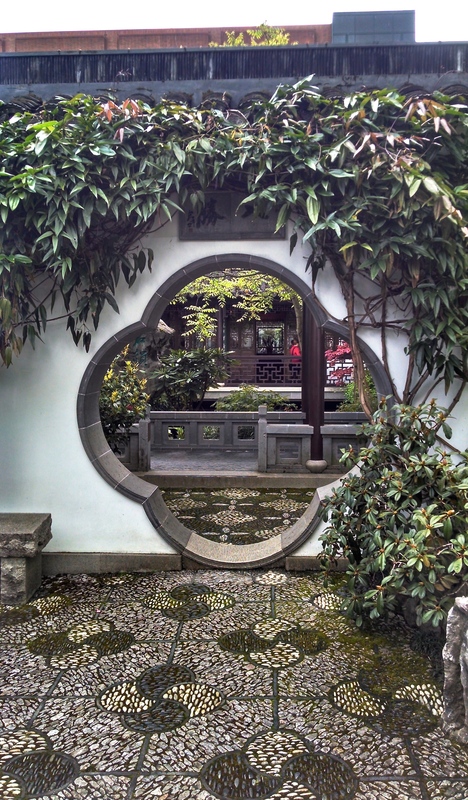 Then I began to be awe-inspired by the Yin-Yang connection beyond the walls, in the way the city itself contrasted starkly with the garden. 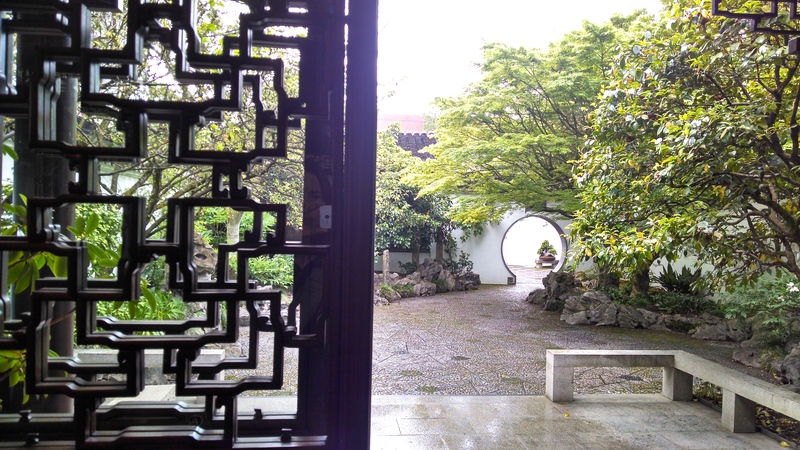 To finish my sweet adventure I stopped into the tea house within the garden for sustenance. Before you enter there is a sign requesting guests to silence their cell phones. Um…awesome. For my first ever formal tea experience, I chose the Golden Monkey black tea accompanied by pecan cookies. 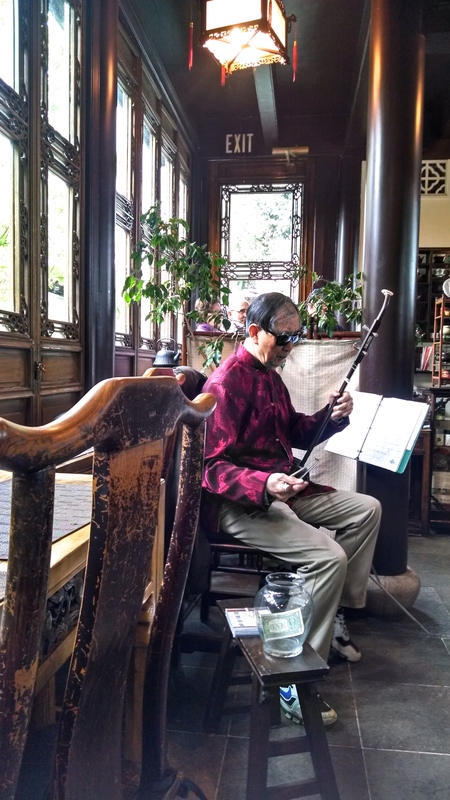 Exquisite music struck up next to me and suddenly I noticed the man serenading us. I purposely abandoned my Kindle in my bag, sat back and enjoyed. There was no need to do anything else but that. When I left the garden with sweets and tea lingering on my breath, my skin still damp from the rain, and a drunken grin on my face…it all changed. The traffic jarred my senses, and so did the man who yelled at me the second I was on the sidewalk. A homeless man, startling the poor tourist families passing by, had a thing for my bright green bike helmet. I crossed the street and hurried over to my bike. He made a beeline for me. Plan #1: Unlock the bike with a quickness, then ride like hell. Plan #2: Whack the attacker with my bike lock. 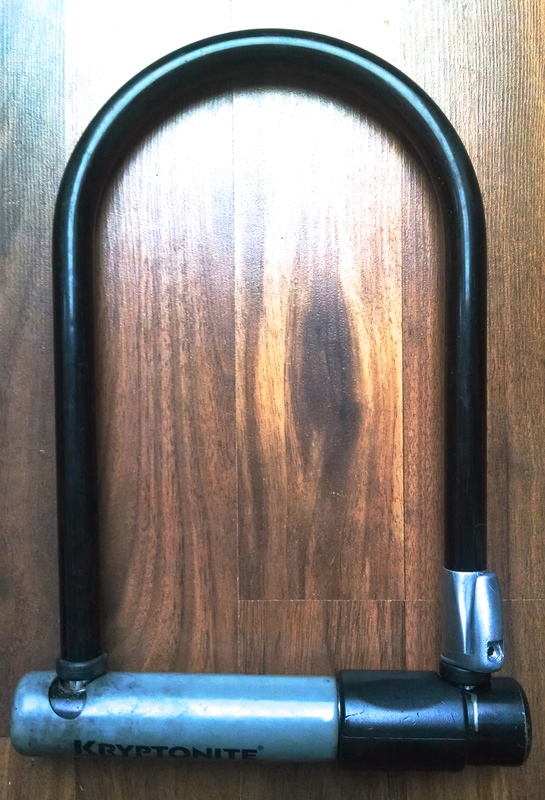 This is my bike lock. He was muttering incoherent things and flailing wildly while I unlocked my bike as quickly as I could. I realized that I would have to face him head on. I gripped my bike lock in my right hand and stared at him without speaking. He looked me up and down and said: “Alright.” He showed me what was left of his teeth as he smiled, then he gave me a peace-offering, which he carefully rested upon Silvie’s handlebar. The brown sugar and cinnamon Pop Tarts. In Yin and Yang there are opposites which cannot exist without one another. Fire and water. Male and female. Light and dark. Perhaps me and Pop Tart Man are another example of this philosophy. 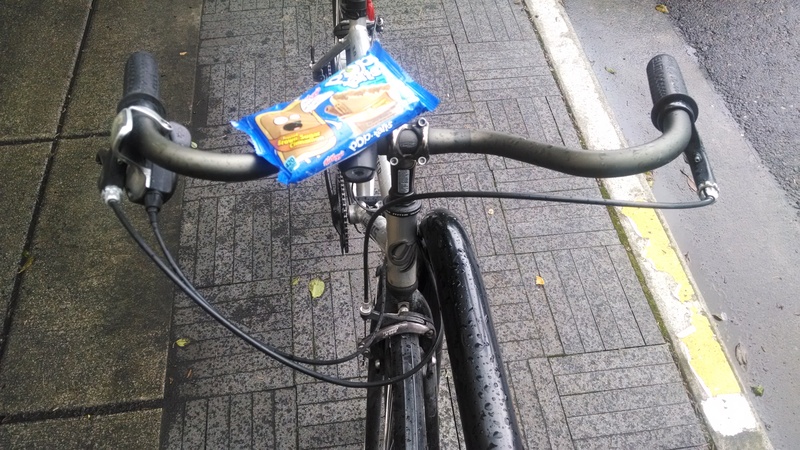 Or perhaps, I just scored a bag of Pop Tarts. Previous Post In Celebration of 500 Followers…A Happy Dance! Hmm, a Zen story with an interesting twist. Yes, it reminded of the tea ceremony in Japan as well. Right?! I’m starting to realize that my stories, in fiction and in life, have mega twists. Keeps things interesting though! What a great escape from the city, a place to chill out and slow down. A pity it’s not free to all but that would probably defeat the purpose. It’s a long time since I lived in a city but tranquility must be hard to find. It totally is! The gardens are pretty expensive to maintain from what I understand, so the charge is necessary to cover that. Luckily, we have plenty of free nature options for me to escape to here. I’ve been hiking in a forest less than a mile away. You made me feel that Yin and Yang with the relaxing walk through the gardens and then the sudden craziness of the city. That’s true that we can’t really appreciate one without the other. Seems to be all around us, doesn’t it? Strange to think about, but contrast brings a necessary balance. Beautiful garden, I can feel the peace through your photos, shame about the cover charge so it’s not available to all, but I guess they have to maintain it. It truly is! I took a hundred photos, because everything was so stunning. It was difficult for me to choose only a few for the post. Agreed about the cover charge. Luckily, there are many free green spaces for us to enjoy as well. What a beautiful journey, Britt, and I love that your bike is called Silvie. These are really lovely photos too! Silvie’s the best. We go way back! Thanks, love. I took a million photos, since everything was so stunning.